Thrilling Tom the Dancing Bug Stories is a 2004 collection of Ruben Bolling’s weekly Tom the Dancing Bug cartoons. Tom the Dancing Bug is still the finest in clever, straight-faced satire, and this collection is over 200 pages – three times as long as either of the previous collections. And, like those it’s not a complete collection for any given period. Nevertheless, most all the classic features are here – God-Man, News of the Times, Did You Know? – but we need more Super-Fun-Pak Comix. There’s a lot more overtly political content here than in either of the previous collections; the majority is post-9/11 anti-Bush material, although Bolling isn’t afraid to stick it to the left here and there. Bolling is spot-on in most of these comics, but they do feel dated now. Never fear, though, there’s plenty of non-political material here, too, and the gems of this sort are the ones that have aged best. Bolling covers his usual wide array of topics, and he also displays an impressive degree of baseball savvy. 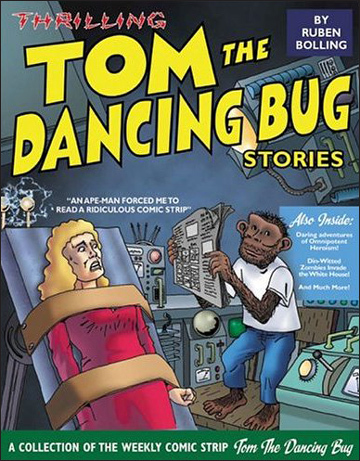 It’s not comprehensive, but Thrilling Tom the Dancing Bug Stories is a fantastic collection.